Help Needed for King City Women’s Craft Ministry: There are several ways that you can help! Donate craft supplies: cardboard egg cartons (dozen), plastic eggs (solid color, regular size), magazines (pictures or words for journal covers), Christian catalogs, and wide men's ties. The wider the better! Please place on the Ministry Table marked “King City”. March 4, 11, 18, 25 from 1-5pm at PBCC. 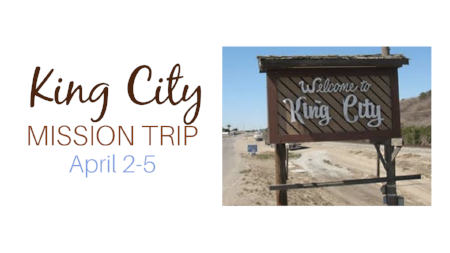 Volunteer in King City: join us April 2-5 (Monday-Thursday, any or all days). All are welcome (Spanish speakers are especially helpful). Help with craft time, or provide childcare for women doing crafts. KING CITY PRAYER PARTNERS: Consider being a prayer partner for our youth and adult volunteers. Sign-up at the Ministry Table. Envelopes (with notes & goodies) must be returned no later than March 25. Contact Karen Stothers to sign up.